NinjaLoader is categorized as a potentially unwanted program, and thus it would be best to remove it from your computer. Developed by Click Yes LP, NinjaLoader provides users with the ability to download media from YouTube, Vimeo, DailyMotion, and similar sites; also, it allows to convert any video file to any format – flv, avi, mkv, mpeg, mp3, and others. However, we encourage that you delete this program from your system because it is not as functional as it promises. 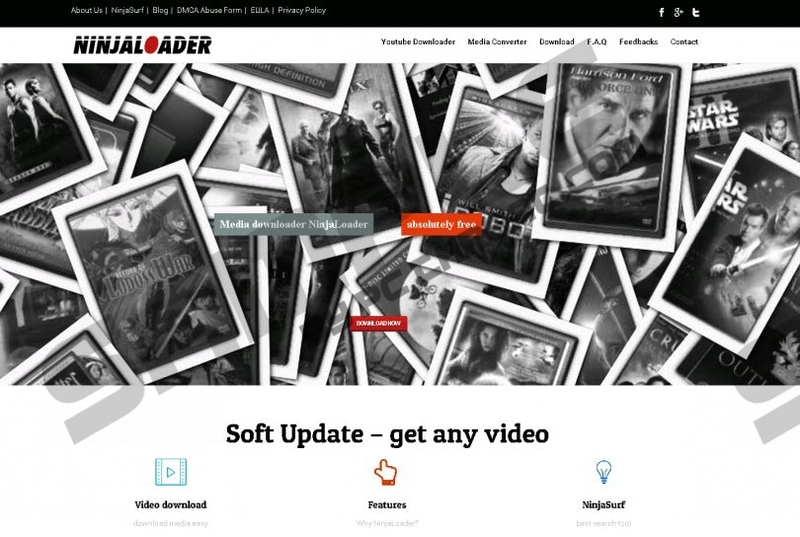 Read this article to learn more about NinjaLoader and why we do not recommend this program for your media downloading needs. Some users complain that the moment NinjaLoader gets on computers, it starts displaying ads. Indeed, the official site ninjaloader.com states that in order to make this potentially unwanted program accessible to the end user for free, NinjaLoader might display advertisements in the first search item and NinjaSurf. NinjaSurf is a component to NinjaLoader which works as a search engine continuously looking for videos on web resources. The advertisements might not only be annoying, but also unreliable; if you click on the promoted third-party links, it is possible that you will be taken to unsafe third-party websites. This is how a lot of computer users infect their system with malicious content, so we strongly advise that you remove NinjaLoader and look for a more reliable alternative. At the moment, only the users from UK and USA can download NinjaLoader from the aforementioned official site. However, it is known that this potentially unwanted program also reaches target computers via bundles; thus, it might gain access to your system without being directly downloaded from the official site. Software bundles is not the most reliable software distribution method; therefore, it might be possible that you will install NinjaLoader with additional programs that can be malicious. In order not to risk compromising the security of your computer, locate NinjaLoader and additional suspicious applications, and delete them from your machine. This potentially unwanted program is also known to start with Windows automatically; what is more, the NinjaSurf component is always functioning as a hidden process when the computer is not being occupied by you. This program can update itself or include components automatically without asking for your permission. Thus, you might not always see this program being active and have complete control over it; therefore, we would advise you to remove it in order to prevent it from making any unpleasant surprises. Even if you have decided to delete NinjaLoader from your computer, it might not be that easy. Some users complain that this program can be hard to uninstall because it does not have a fully working uninstall in Control Panel. Therefore, if you have a choice, avoid this program at all costs. Nevertheless, we have added instructions that will help you remove this program from Control Panel; however, if that not possible for you to complete the removal, the best tool to terminate NinjaLoader is automatic antimalware software. We suggest that you install a tried and true antimalware tool which will detect and get rid of NinjaLoader once and for all. Open the Charm bar, choose Settings, and click Control Panel. Select NinjaLoader and click Uninstall/Change. Under View by, select Small Icons, and go to Programs and Features. Choose NinjaLoader and click Uninstall/Change. Switch to Category View and open Add or Remove Programs. Select NinjaLoader and click Remove. Quick & tested solution for NinjaLoader removal.